After the 250 stop in Memphis, the second ATP stop in the USA is Delray Beach for hard court tennis, South Florida style. Delray has a collection of interesting players, though this tournament lacks an elite name, we should see good matchups this week. Both were quarterfinalists last week in Memphis, with Kukushkin holding a h2h win, and a slightly better start to his season. Young could do well this week and defend as much of his finalist points from last year as possible, but he could also see himself ousted as a seed. Denis Kudla is 4-4 to start the year, while Del Potro is playing for the first time since the 2015 ATP Miami stop. He’ll try once more to reboot his career and put his wrist injuries behind him after playing just 14 matches over the last two seasons. Del Potro is one of the few active Grand Slam winners on tour, and he once had the game to challenge the world’s best. We’ll see what kind of form he’s in, and if he still has that type of game in this match. Kudla’s ball striking makes him a consistent opponent. Sam Groth is a horrific 1-7 since last fall’s US Open, as his one dimensional serve first game has failed to be enough to win matches as of late. Rubin is a rising young American talent who has beefed up his game over the past few months. He has a challenger semi and a slam win already in 2016, with a good run in Delray quite possible. This tournament is a stop on the road in his development as a player. Former Delray champion Kevin Anderson will open with American Austin Krajicek, and though Anderson is just 1-2 to start the season, he should move his h2h to 4-0 against Krajicek, who is just 2-4 to start the year. Memphis semifinalist Sam Querrey will face a struggling Thiemo de Bakker (1-3 in his last four). Anderson should be on upset alert against Querrey, Sam leads the h2h 8-5, with five of those wins coming on hard courts. Querrey is lower ranked, but I have him sliding into the quarters. Young/Kukushkin will face Memphis finalist Taylor Fritz, a seeded entry, or wild card Tim Smyczek. The teenager Fritz stunned in Memphis, reaching his first ever ATP final in just his third career ATP tournament. Fritz beat three ATP caliber opponents, including winning a pair of third set tiebreaks, to advance. He could be tired out and fall to Smyczek, but his talent is clear, and he’s likely to win at least one match in Delray. Fritz also has a shot against Young/Kukushkin, but with stamina a factor, I have Querrey vs. Kukushkin in the quarters. Querrey should defeat Kukushkin at that stage given the surface. Defending champion Ivo Karlovic will open with qualifier John-Patrick Smith, Karlovic lacks a win this season, but he’s likely to get that over the journeyman Smith. Del Potro/Kudla await in round 2, and Del Potro could surprise adn reach the quarters, but Karlovic is the favorite in his seed line. Jeremy Chardy has two ATP quarterfinals this season, and he’ll face off with Matt Ebden first off. Ebden hasn’t won a match this year and Chardy is likely to take his heavy hitting game against Rubin or Groth in round 2. Rubin has a great shot at his first ATP quarterfinal, and I have him pulling it off as a dark horse this week. Rubin vs. Karlovic, or Chardy vs. Karlovic, is an interesting matchup, and Rubin could do like Fritz did in Memphis and make a deep run, Karlovic is the favorite though. Bernard Tomic is 8-4 to start the season, and hard courts suit his junkballing game well. He should get past serve and volleyer Rajeev Ram in round 1 and either Marcel Granollers or Illya Marchenko in round 2. He’s far and above the best hard court player in his section. Steve Johnson has been struggling with just a 2-4 record to start his season, John Millman has a similar hard court centric style and has played every week of the ATP season thus far. It’s hard to parse between them, though Johnson should have an edge at home in the states. Qualifier Radu Albot will go up against Memphis quarterfinalist Benjamin Becker for a round 2 spot. Becker beat Millman in Memphis, and I have him reaching the quarterfinals this week once again in Delray. Tomic won his last meeting against Becker after previously being 0-3, at this point in their careers Tomic should be able to get himself into the semis. Grigor Dimitrov has the talent to walk away with the title this week, but he’ll need to find form and get past Israeli veteran Dudi Sela first. Memphis semifinalist Ricardas Berankis, an undersized battler, looms in round 2, presuming Berankis beats Damir Dzumhur for the second week in a row. Dimitrov is 7-3 to start the season and should outwork Berankis to reach the quarters. He can earn his 10th win of the season over Adrian Mannarino. The #8 seed Mannarino opens with Malek Jaziri, who continues to be an out of shape underachiever, with qualifier Dennis Novikov, or qualifier Tatsuma Ito next up. Mannarino should reach his second quarterfinal of the season before falling to Dimitrov. Sam Querrey should reach the semis this week as well, but Rubin has the chance to be the most impressive. He’s clearly improved physically and mentally since turning pro, and the John McEnroe protege can reach the semifinals without having to face an opponent in good form. Chardy and Karlovic are tough matchups, and Del Potro could be as well, but Rubin is going to give the home fans something to cheer about this week. Querrey has an experience edge over Rubin, Dimtirov is 2-0 against Tomic in the h2h. 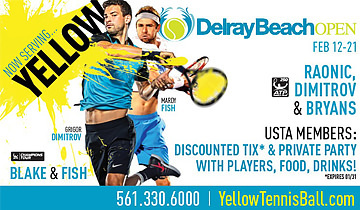 Dimitrov is 2-0 against Querrey in the h2h, and him or Tomic are the favorites for the title in Delray Beach. A trophy in Delray will go a long way to helping Dimitrov rebuild his ranking.